Editor's Update, Dec. 29, 2011: We've added more photos to this story. Thank you to Duane Williams, KLCB-KTNY Radio, for additional pictures. The Heritage Museum's Shay locomotive made the remainder of its trip December 22 to its restoration shed, where it will be refurbished and restored to running condition. The shed, the original engine house, is located behind the cook shack on the museum grounds. 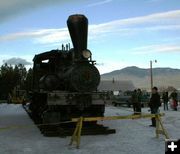 The engine was moved about halfway December 3, along temporary track laid through the museum's parking lot, and moved the rest of the way last week. With the efforts of several dedicated volunteers, the Shay is on its way to being restored. The restoration is being started through a grant from the National Railway Historical Society. The grant won't be enough to finish the job, however, so donations are being accepted to help "Ol' Four Spot" return to its former glory. Anyone wishing to donate to the Shay's restoration can contact the Heritage Museum through its web site at libbyheritagemuseum.org. Who let the train out? Photo by Duane Williams, KLCB-KTNY Radio, copyright 2011. Standing tall Photo by Duane Williams, KLCB-KTNY Radio, copyright 2011. Shay Photo by Duane Williams, KLCB-KTNY Radio, copyright 2011. Forklift Photo by Duane Williams, KLCB-KTNY Radio, copyright 2011. Confabing Photo by Duane Williams, KLCB-KTNY Radio, copyright 2011. Ol� Four Spot Photo by Duane Williams, KLCB-KTNY Radio, copyright 2011. Close-up view Photo by Duane Williams, KLCB-KTNY Radio, copyright 2011. A workhorse in its day Photo by Maggie Craig, LibbyMT.com. All page content copyright 2016. All rights reserved. May not be used without permission.